First Line: Emma Caldridge went to sleep in first class on a British Airlines flight from Miami to Bogotá, and woke sixty seconds before the plane was downed in the Colombian jungle. Emma is thrown unhurt from the plane and watches in dread as guerillas round up the rest of the crash survivors and lead them into the jungle. At first wanting to get help for herself and the others, Emma heads in a different direction, but one by one her alternative routes are closed off to her, and she finds herself following the others and trying to stay hidden from the guerillas. Along the way, she runs into an injured government agent, Cameron Sumner, who was left behind to die. A task force from the United States is on the way to search for survivors, but time is running out. Fortunately Emma is no ordinary woman, and she guards a very powerful secret. I love thrillers with smart, determined female leads, and Running from the Devil has a winner in Emma Caldridge. I could happily have spent the entire book reading about her surviving on her own out in the jungle, but I suppose that wouldn't have done much for the plot. Emma is such a fascinating character-- a chemist for a cosmetics company and an ultramarathon runner-- that the few times the plot veers away from the natural green jungle and moves to the unnatural concrete jungle inhabited by Washington, D.C., power mongers, I wanted to groan. Unlike most thrillers I've read, there were secondary characters that shone brightly for their brief close-ups, but they didn't fade permanently from view. 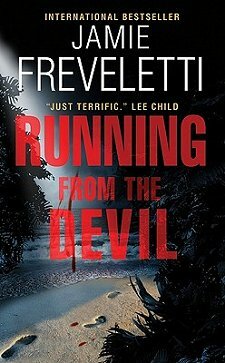 Freveletti made readers care for those people, and she was aware that we would want to know what happened to them. The only thing that I had a hard time swallowing was the dire secret that Emma was guarding so closely. I was happy to see that she didn't shirk her responsibility for it, but I just didn't buy into it. Since I do my best to avoid spoilers, I won't discuss it any further. If you're in the mood for a fast-paced thriller with a strong, captivating female lead, I think Running from the Devil may be just what the doctor ordered. Running from the Devil at Amazon. Running from the Devil at The Book Depository. Running from the Devil at Your Favorite Indie Bookseller. I'm not sure this is for me but I like the premise -- what a set up for a good thriller: battling environment and bad guys at the same time. Cathy - This does sound interesting as a premise. I'm not as a rule drawn to thrillers, although I've read my share. So I'll be honest - not sure I'm going to go for this one. But I did really enjoy your review. Sounds really good to me. I do like a strong woman protagonist. Candace-- It is a very good set-up for a thriller! Barbara-- Emma's a bit different from the strong women I've been reading about lately.